Diamond may still be shorting me on manga every single week, but despite that I continue to bring you this list of what’s out next week. This week I combine Midtown’s list (missing a title arriving at my store) and my own comic shop’s (missing one on Midtown’s list). Both, ironically, from the same publisher. In Viz’s regular line, we’re up to Vol. 21 of 20th Century Boys, as things pound relentlessly towards a climax. And there’s July’s pile of stuff from Yen Press. 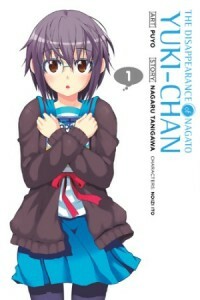 Midtown doesn’t show The Disappearance of Nagato-Yuki-chan, but my shop’s getting it in, so I’m counting it here. For all those who want a kinder, gentler Haruhi series with less world saving and more adorable, this is for you. There’s also Durarara!! Vol. 3, which Midtown lists but my store does not. The striking covers of DRRR always appeal, but the manga artist has shown a deft touch with the plotting as well. That’s a lot of great stuff! What are you getting?